If there’s one country that took my breath away this year, it was The Gambia. As soon as I left the airport of Banjul, my eyes were darting everywhere, from the colorfully-dressed locals selling fruit and vegetables on decrepit outdoor tables to the many goats and stray dogs that roam the Gambian streets as they please. All houses seem abandoned. Everyone lives and works on the dusty roads. My first day in The Gambia started in the Baobab Cultural Centre in Kembujeh from where we started the exploration of the tropical 1000-acre reserve Makasutu. A dugout canoe took us along the river Mandina Bolong. Of all the excursions I’ve done in The Gambia, this boat trip was one of my favorites. Surrounded by mangroves, locals come here for fishing and collecting oysters. If you look well, you can still spot the oysters glued to the branches just above the water. From here, they are transported to oyster camps for processing. The canoe took us to Base Camp where we had a drink near the elephant-shaped swimming pool, and climbed the lookout point offering an impressive view over the Mandina Bolong. Every Wednesday and Saturday, locals entertain the tourists with drumming and dancing. Starting at Base Camp, we went for a trek through the Makasutu Cultural Forest where our guide told us about the history of the area and the medicinal properties of the local trees. Halfway across the forest, we met a local palm reader who lives in a small hut and dresses like Jay Z. His fortune telling skills were a bit dubious, but it was definitely a funny experience. He studied my palm through a mirror and babbled in a local dialect that was then translated by our guide. It went like this: “I can see that you are not married.” (I don’t wear a ring), “I can see that you are a foreigner and that you are here with a group.” (Evidently the palm reader can see through those Jay Z sunglasses), “Everything is very easy for you and you immediately get what you want.” (I wish), “There is no darkness in your life and you will live long and be very happy.” You get the picture. After the forest walk, we had lunch at the world-famous Mandina River Lodges. Either built on stilts or floating on water, the lodges offer breathtaking views on the mangroves and the Mandina Bolong. They are definitely a must-see. Even the inside of the lodges are amongst the most superb and chic you’ll find in The Gambia. If you’re lucky, you’ll also spot a few baboons here and there. The Mandina Lodges were mentioned in the book 1001 Escapes To Make Before You Die, a guide for those in search of the world’s most unusual and beautiful places. Later, as we were winding our way through the forest towards our next destination, the Tumani Tenda Camp, we came across a large troop of baboons. Some were sitting in the trees, but most were foraging the forest floor or grooming each other to eliminate insects and dead skin. Baboons can cause quite some havoc in hotels as they love to steal anything from shampoo to food, but in their natural habitat they were rather quiet and easily approachable. A few minutes later, we arrived at Tumani Tenda Camp, named after the peanut picker Tumani and the Tenda riverbank. If you want to experience the authentic African way of life, then Tumani Tenda Camp is the place to be. The lodges offered for rent are entirely made with local materials and workmen and are extremely primitive – small, with no decoration whatsoever, and only a handmade bed and cupboard to fulfill the most basic of all needs. Both shower and toilet are communal. Comfort is a far cry in the Tumani Tenda Camp, but you’ll have a good idea of what it’s like to live rural Gambian style. Luckily, various activities are on offer, including fishing lessons, bird watching, boat trips, oyster collection, a history talk, beekeeping, tree planting, and more. However, the greatest thing about Tumani Tenda Camp is that the profit from staying in these lodges will go back to the community (the Jolla village with approximately 300 inhabitants). The idea is to be responsible and self-sustainable, to escape the extreme poverty that reigns over The Gambia. The villagers that don't work in the lodges provide food through farming and fishing. Our next stop was the Lamin Lodge, a three-storey structure built on poles at the head of Lamin Bolong. We started with a drink at the top level of the lodge, from where we had an excellent view over the nearby creek. Afterwards, a dugout canoe rowed us through the mangroves to watch the sunset and to spot the many Gambian birds. We ended our first day in The Gambia with a visit of the Ocean Bay Hotel & Resort, a five-star luxury hotel located in the heart of Cape Point-Bakau. 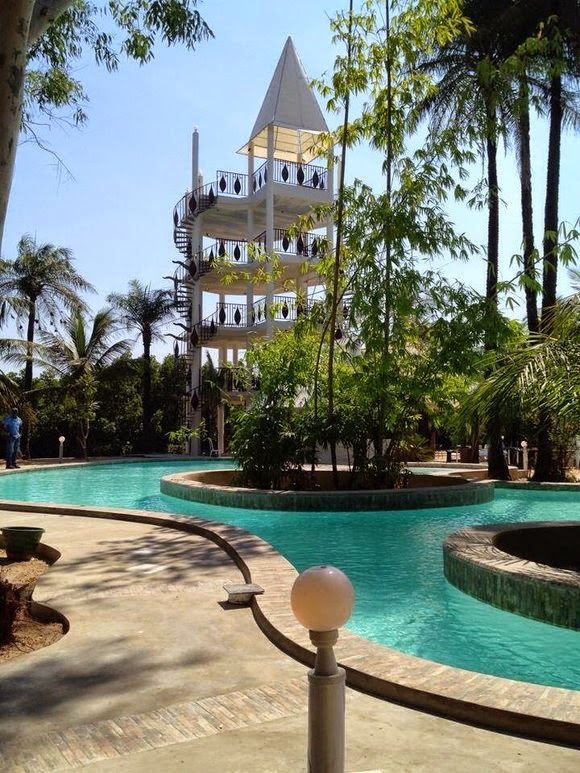 The best parts of Ocean Bay: the photographic view of the Atlantic Ocean and the River Gambia, its excellent dining facilities, and many recreational activities and services. Disclaimer: This trip was sponsored by Visit The Gambia, Bamboo Hotel, and SN Brussels Airlines. The opinions are my own. Wow, what an adventure! That lodge is impressive. Like the lookout tower. 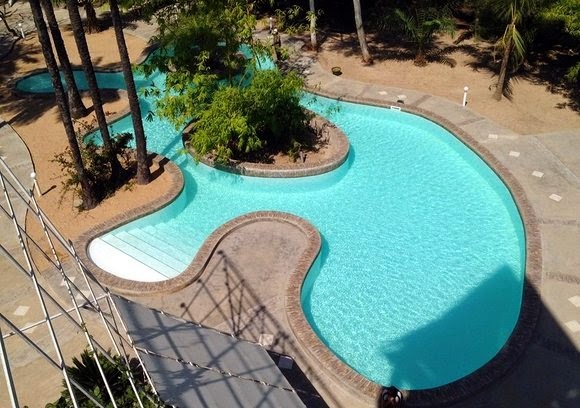 That really was an elephant-shaped pool. Fantastic pictures. Looks like an amazing place to visit. This trip was truly a feast for the eyes. I had to look at all the photos. You must have had a great time. Oh, wow! What amazing pictures of what had to be an amazing adventure! Yes, indeed, wonderful compositions to remember! Beautiful photos with the colors of Africa! An amazing trip! Looking forward to your next post and more photos! 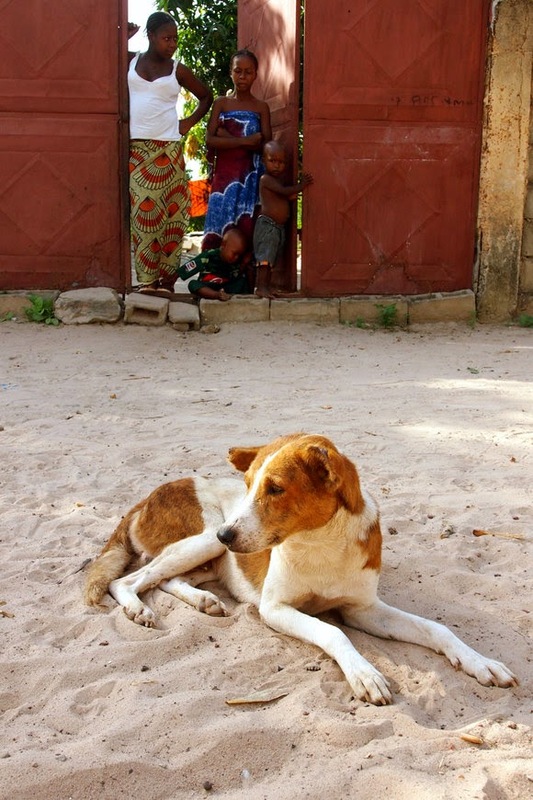 You mention stray dogs but you KNOW my next question . . . .
Each photo is breathtaking, in and of itself. You captured the spirit and emotions of the scenes. I'm embarrassed to say that I'd never heard of The Gambia. All the more reason I'm glad for this post. Thank you. It looks a bit like Costa Rica - beautiful terrain and people. What a cool trip to take. Interesting life experience. Funny on the fortune teller. Following you on GFC. That is quite a trip and you have documented well! Wow, what an adventure. Your photos are excellent and tell a story. I enjoyed thes post very much. Oh wow!!! I absolutely love these photos! Just stunning! Afrika, een mooi continent. In dit land ben ik nog niet geweest. Ben blij hier mee te kunnen genieten van je prachtige trip. This is goooorgeous. I love all your photos! How amazing to go to Gambia though. ^-^ I've been to China and realised I really quite adore travelling...although, I love my own bed so so much. Hehe. Still! The experience! Amazing. Oh wow! I've always wanted to visit Africa (particularly Kenya) but I definitely think I need to add The Gambia onto that as well haha! It sounds absolutely amazing and I'm so glad you shared all your favourite places and tips too! Lovely photos girl!! Amazing post! Wow, what an amazing trip and what amazing pictures! Thank you for sharing all of this!